This is the time of year when skincare starts to get serious. Summer has been over for months and winter is here. So you should be thinking of having a serious winter skincare routine. Especially a routine that will take your skin from the frigid winds and dry air until spring time. That includes a good moisturizing cream. Moisturizing cream is very important for anyone over the age of 30. It is at that age when visible signs of aging start to show in the facial region. Usually with hyperpigmentation but also with slack skin and signs of fine lines and wrinkles. Matrixyl® synthe’6®: May help support collagen for healthy-looking tone and texture. Argireline®: Helps to visibly smooth the appearance of fine lines, leaving skin feeling soft. Enriched with anti-aging antioxidants Vitamin C and Green Tea, this intense hydrating, peptide-infused formula helps to restore the look of your skin for a more youthful-looking appearance. This product is 100% vegan, cruelty-free, paraben-free, sulfate-free, mineral oil-free, lanolin-free, gluten-free and GMO-free. To use: Apply a rich layer onto clean face and neck. Use in the morning and evening alone or in combination with your favorite DERMA E moisturizer. If used during the day make sure to use a sunscreen over the moisturizer. After using this for about 3 weeks I noticed my skin was less drier than before, my skin looked visibly healthier and many signs of aging had decreased. I had small wrinkles next to my lips that had disappeared and the tone of my skin had improved too. Skin felt soft and looked younger. Derma E Advanced Peptides & Collagen Moisturizer is a available online at www.dermae.com. Or in many stores across the United States, such as Whole Foods, Target, CVS and Sally Beauty Supply. Go to the store locator to find Derma E near you:http://dermae.com/locations.html. 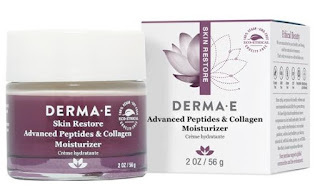 Like Derma E on Facebook:https://www.facebook.com/dermaenaturalskincare; Follow Derma E on Twitter: @derma_e; Subscribe to Derma E on YouTube:https://www.youtube.com/user/DermaEBodycare; Follow Derma E on Instagram:http://instagram.com/dermae# and Follow Derma E on Pinterest:http://www.pinterest.com/dermae/.